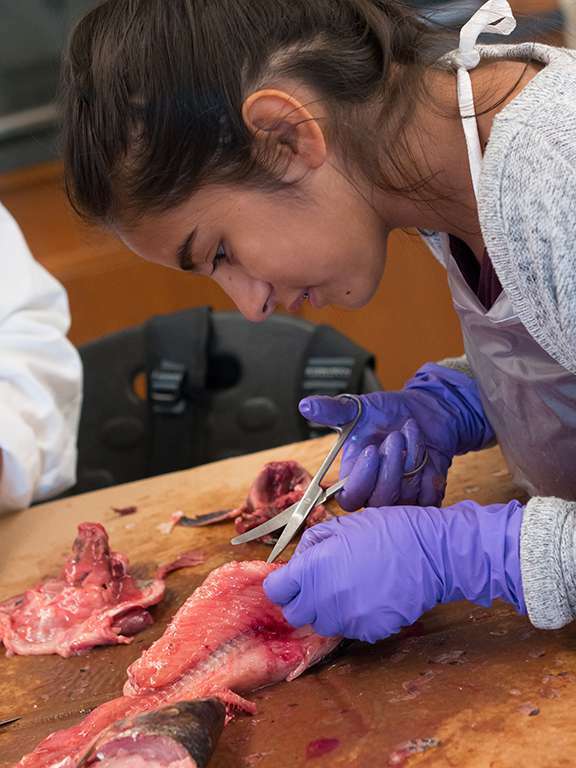 From learning how to suture a wound, to how to draw blood from a vein, to inserting an IV line, a group of Indigenous teens from across Canada had the chance to participate in science activities and experiments during their weeklong stay at the Eagle Spirit Camp, hosted by McGill University. The camp was created in 2005 by the First Peoples’ House of McGill but has since been adopted in 2017 by the Indigenous Health Profession (IHP) Program in the University’s Faculty of Medicine. “Before, the camp was more general and more sports-based, but we dialed that back a bit and we focus more on science and on health because of our program,” said Jessica Barudin, IHP program manager. The camp’s goals are not only to inspire Indigenous youth to pursue a future education in the sciences, but also to open up their worldviews to both traditional and western perspectives. “We are hoping to motivate them to look at science in different ways because oftentimes there’s a lot of barriers,” Barudin said of the camp, which wrapped up last week. The camp days were divided into morning sessions where knowledge keepers were invited to speak about creation or traditional stories about mythology, or lived experiences on land and spirituality. “We do traditional stories like Mohawk, Algonquin, Cree, Inuit and Mi’kmaq and then we go to the lab and do an experiment or activity and we try to relate the stories that we learned in the morning to science,” explained Erin Patton, one of the camps senior counselors. Elaine Delaronde, an acupressure therapist, participated in one of the morning sessions at McGill’s Macdonald campus and spoke to the campers about natural medicines. “I talked about going to bed early, shutting down, getting a good night’s sleep and eating properly, and taking herbs for prevention and to nourish with,” said Delaronde. Delaronde showed them samples of dandelions, plantains and burdocks, and provided the campers with printout profiles of the plants and the different ways they can be used for vinaigrettes or teas. “A lot of them come from Native communities so they did have knowledge of some of the medicine through their family members,” she said. Delaronde was also impressed by McGill’s decision in wanting to incorporate traditional practices. “I think McGill is on the right path. They do several workshops. I did one for a couple of years in a row for McGill for older universities students where they camped out for a week,” said Delaronde. This year, the Eagles Spirit Camp was one week long, as opposed to its normal three-day venture. Barudin described it as their “pilot” year – testing the weeklong format with a group of a dozen campers from grades seven and eight. Barudin said it was important to them to make sure all the campers felt safe and comfortable, especially for those coming from the furthest parts of the country. “The difference (between the three-day and weeklong camp), I find, is that the youth get to know each other more deeply. They’re getting to be more confident and more acquainted with their surroundings and the counselors, and they’re just coming out of their shells a bit more,” said Barudin. The camp hired four senior counselors who were Indigenous McGill students or alumni, and three junior counselors who were past campers. “I find the campers are very interested, they are asking questions and I find it’s really good because most of our camp counselors have a background in health, so they can really get to ask us questions and we get to explain it to them well,” said Patton, a nursing student. “I am learning a lot from them too about their culture,” added Abby Frazer, a senior camp counselor and first-year med student. Barudin hopes to keep in touch with the youth at the camp throughout the year and to help open their eyes to the different resources available to them. Frazer also noted that many Indigenous communities lack health professionals who have an appropriate understanding of Onkwehón:we. During the afternoon activities, the campers explored different health professional programs, ranging from nursing, to physiotherapy, to reproductive health and dietetics. Treena Delormier, an associate professor at McGill, who also sits as associate director with the Centre for Indigenous Peoples’ Nutrition and Environment, spoke to the campers about the importance of good nutrition. She said that growing up in Kahnawake, she had family and female teachers who were encouraging and supportive of her wishes to pursue a career in the scientific field. Delormier said that science can be quite isolating and not just for Indigenous students. There is a need for new innovative programs to teach the subject. Jordyn Goodleaf also agreed that her favourite part of the camp was been, in fact, the hands-on experiences. “I want to be a surgeon when I get older,” said Goodleaf. During the suturing activity she felt very encouraged by the instructor. Throughout the week the campers also had access to iPads as an educational tool to take pictures and videos. On the last day of camp, Barudin said the campers would use what they documented for presentations. “The goal with the iPad is to have a project to present for people who might come and visit and just try to put together all the Indigenous stories and sciences and natural sciences, and trying to make sense of the world around us,” said Frazer. “It’s a really good experience. I wish more people from Kahnawake came because I was the only one. If you like science and you like hands-on activities, this would be good for you,” said Goodleaf.